Guatemala’s Pasión River runs 354 kilometers through primary lowland rainforest and former rainforest converted to agricultural land, to empty into the Usumacinta River which forms the border between Guatemala and Mexico. Hundreds of thousands of people, mostly indigenous Qeq’chi Mayans, live along the Pasión and rely on the river for their subsistence. As Guatemala’s palm oil industry has grown, the river and the surrounding rainforests have suffered grave impacts — impacts that have also contributed to the ongoing crisis of human rights and justice in the region. One case in particular, centered on the Pasión River as it flows through the municipality of Sayaxché, is emblematic not only of the crisis of environmental rights in Guatemala, but of the ways in which the global palm oil industry is approaching such crises wherever it operates. In 2015, two massive pollution events in the Pasión River resulted in the death of tens of thousands of fish and affected the economic livelihood of least 12,000 people from 20 indigenous communities. As the communities began to investigate, Guatemalan palm oil company Reforestadora de Palma de Petén (REPSA) admitted that intense rains had caused its palm oil oxidation ponds to overflow — though the company later denied this. An estimated 100 miles of the Pasión River were affected by the mass fish die-off. Photo courtesy of El Informante Petenero. The US Environmental Protection Agency (USEPA) sent a team to investigate and found that, indeed, the contamination appeared to be directly linked to overflow from REPSA´s processing plant; the EPA also reported that REPSA was illegally discharging untreated waste directly into the river. At no point were downstream communities warned of the spill, let alone the waste discharge. Neither had REPSA conducted an Environmental Impact Assessment for its operations in Sayaxché. Despite thousands of dead fish in the Pasión Rivier, no comprehensive investigation or remediation effort was undertaken by local authorities. 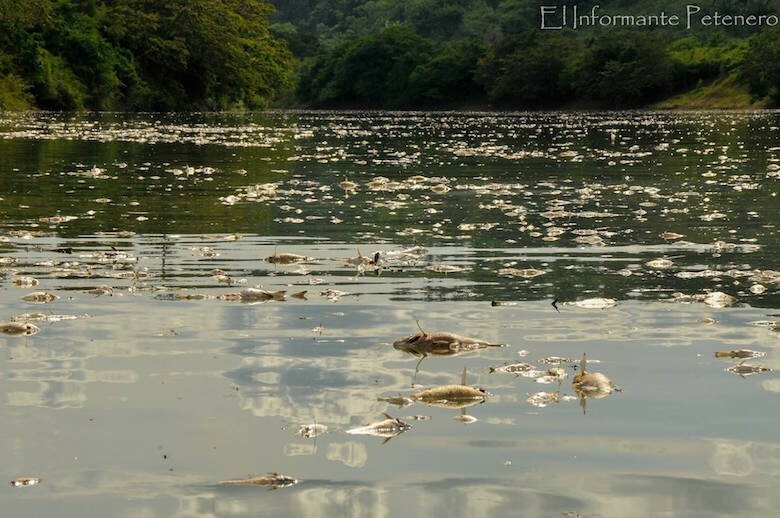 However, a report from the Guatemalan National Institute of Forensics Sciences confirmed that malathion, a highly toxic agrochemical, was found in relation to the fish kill. With no systematic investigation, nothing is conclusive — but one hypothesis suggests that REPSA’s waste ponds, overfilled with palm fruit that may have been dumped due to low market prices, had begun to breed maggots, leading the company to attempt to disinfect the ponds using malathion. Heavy rains then caused the ponds to overflow into the Pasión River, ultimately killing tens of thousands of fish, and potentially leading to untold future health impacts for the local population. 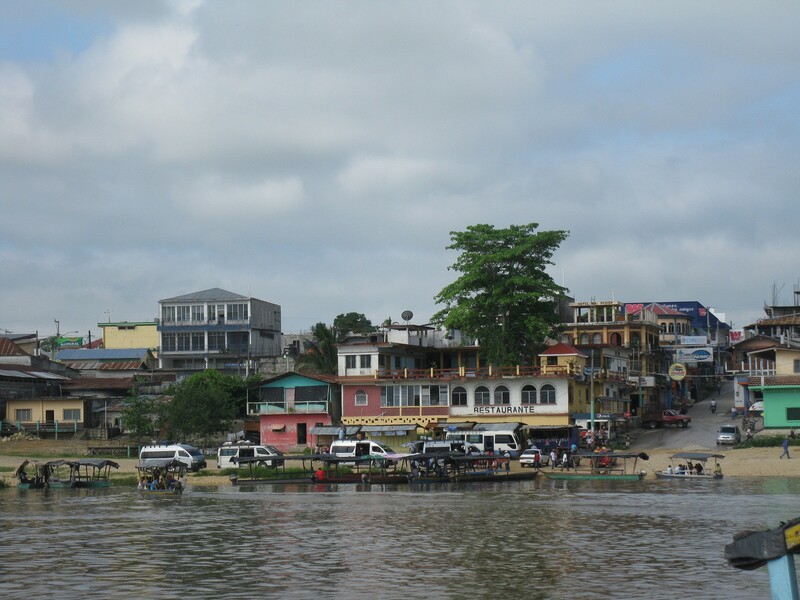 Municipality of Sayaxché on the Pasión River. Photo via Flickr Creative Commons. Rigoberto Lima Choc, a local schoolteacher and member of a civil society organization called La Comision para la Defense de la Vida y la Naturaleza, documented the June spill and filed a complaint on behalf of the organization. According to the Comision, the decision to file the grievance, including a petition to demand that REPSA permanently cease operations, was made through a consensus process that represented the entire population of Sayaxché — 116,000 people, the vast majority of them indigenous. A local court accepted the complaint and on September 17, 2015, handed down an unprecedented ruling of “ecocide.” Ruling in favor of the plaintiffs, the judge ordered that REPSA cease operations for six months in order for a through investigation to be undertaken. But then events took an ugly turn: the day after the ruling, REPSA employees occupied the courthouse and allegedly kidnapped Comision members Lorenzo Pérez, Hermelindo Asij, and Manuel Pérez. Comision member and plaintiff Rigoberto Lima Choc was shot and killed. As these events unfolded, REPSA appealed the ruling and succesfully sued to have the judge recused. Following the killing, Friends of the Earth U.S. reached out to other civil society organizations to make a joint demand that global agribusiness companies and brands suspend sourcing from REPSA until both the murder case and the effluent spills were thoroughly investigated and resolved. An international campaign followed, with Friends of the Earth, Rainforest Action Network and others targeting REPSA’s buyers. 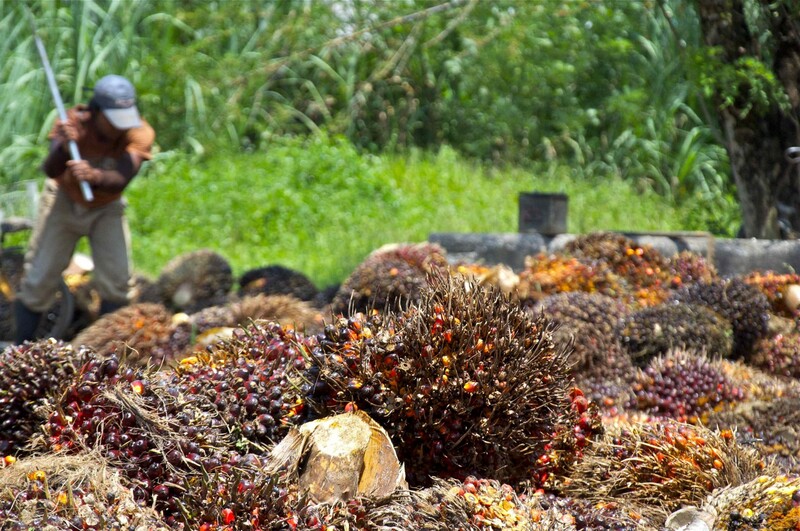 Globally, the palm oil sector is riddled with human rights abuses; in response, high profile campaigns have pressured many global companies to adopt policies to rid their supply chains of human rights violations. The case of REPSA revealed a glaring gap in the implementation of these policies. In keeping with the recently adopted UN Guiding Principles on Business and Human Rights, and thanks to the global campaigns, many agribusiness companies have begun to adopt company level “grievance mechanisms” — formal complaints procedures that allow people harmed by a company’s operations to seek redress. Within the space of a few years, most palm oil growers, processors and traders now have or are expected to have transparent mechanisms for responding to grievances from landowners and community members that arise both within their own operations and from third party suppliers. Several agri-business giants, including Cargill, WilmarInternational and Musim Mas all have company-level grievance mechanisms in place, and report on their responses. Palm Oil extraction in Guatemala. Photo via Flickr Creative Commons. These are important steps, but they fall short of the demand that the multinationals suspend all sourcing from REPSA until the grievances are resolved — a demand that is based both on the shocking impunity that reigns in Guatemala, where seventy-two percent of murders go uninvestigated, and on the track record of an industry, and a company, that has never yet demonstrated an ability to respect and protect human rights. Our concerns were born out in July 2017 when REPSA made its first very problematic attempt to post its own grievance log. As we argue in an article published this week by Cambridge University in the UK, that attempt at grievance resolution looked more like an effort to deflect blame, stigmatize the victims of the ecocide, and publicly defame the company’s critics. More than two years have passed since the Pasión River ecocide and the unresolved murder of Rigoberto Lima Choc. Cargill, Wilmar, and other agribusiness interests and brands have made efforts to work with the company to improve its management of environmental and human rights risks — but have failed to achieve the slightest resolution of either the murder or the effluent spills. On November 24, 2017, “as a result of REPSA’s failure to meet requirements associated with Cargill’s sustainable palm oil policy,” Cargill took a landmark decision to suspend its business relationship with REPSA — a course of action that we believe corresponds to the company’s duties under international norms guiding business and human rights. At the time of this writing, Wilmar International continues to do business with REPSA. While the case of the Pasión River ecocide and murder is extreme and is particular to the context of Guatemala, it is also illustrative of the ways in which the palm oil sector drives both environmental and human rights abuses around the world. Until justice is served for both the murder and the ecocide, and until the effects of the contamination are fully remediated, the violence along the Pasión River will continue to serve as an illustration of the profound abuses that too often serve as business as usual in the global palm oil sector. To learn more, read Failures of Redress, on the Cambridge Core blog.